It was just yesterday when we reported that the Samsung Galaxy Note 4 could feature a tri-sided curved YOUM OLED screen and today Samsung filed a patent that suggests a possible design for the phone. 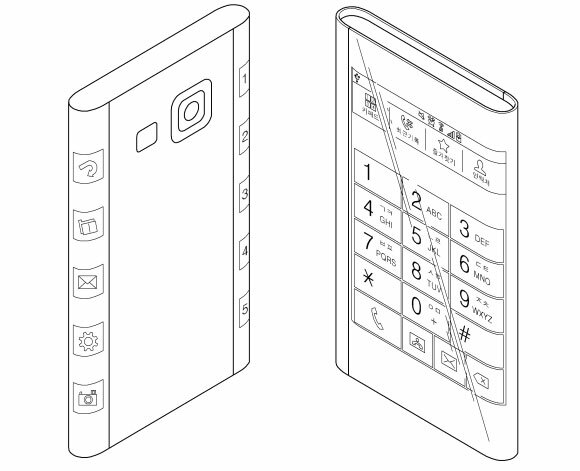 The patent application shows a concept for a smartphone that features rounded edges on the side - that's where the curved YOUM display would stretch. As you can see in the image above, Samsung envisions the user interface of the upcoming phone to make use of that curved space. In the example given, the app and settings shortcuts are placed exactly there. Samsung executive already suggested that the company is experimenting with a new form-factor for the next-gen Galaxy Note. If you want to see how exactly the YOUM display looks like , check out this video demo that Samsung did not too long ago. Listen up!I will tell you one thing.If this is note 4 then there should be a s-pen in the design patent.If this is the note 4 where would the s-pen gone? I think the patent leaked before can be note 4.